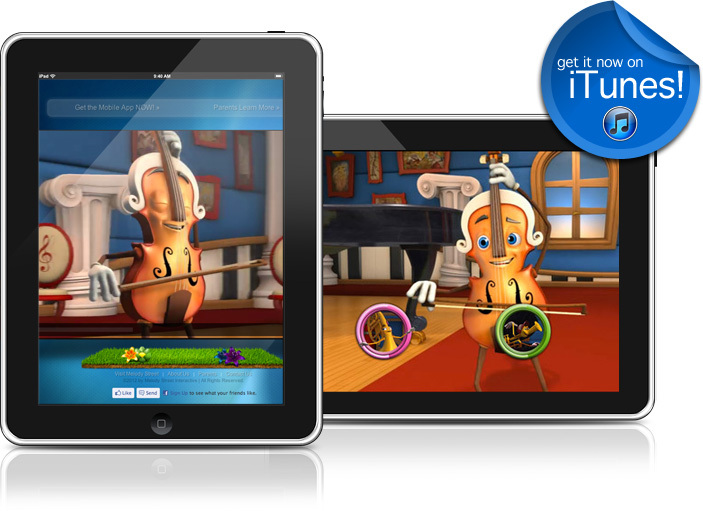 Today's app was developed by Melody Street, a company devoted to introducing children to the world of Classical Music and the orchestra. The fact that they get to orchestrate their own version of Mozart's Rondo alla Turca. This app lets kids decide which instruments will play certain portions of the piece. Their "movie" is then recorded and they can replay it or share it with their family and friends. They also really love the animation, and how each instrument is a character in the movie with its own personality. Possibly the best part is that they can do it over and over, making each movie/piece unique. The introduction to classical music in such a fun, interactive manner. But I think what captured my attention the most is the seamless way the developers have merged a live performer - the 10-year-old host, Ethan Bortnick, on the piano - with the animated characters. I also love how Ethan is actually a very talented musician despite his young age. I think it is important for our children to see other kids like them being successful, because it helps to motivate and inspire them. Melody Street has its own YouTube channel where the instruments come to life and your child can find videos, games, and other fun stuff. It is very lively and engaging for young children. Don't miss their other fantastic (and free!) apps for kids! Disclosure: I was not contacted by Melody Street, but discovered them on my own while doing research for Music Week on MommyMaestra.